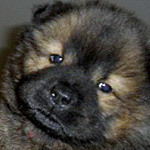 Hello, I recently had a full blooded chow come to be my furbaby. I am NOT a dog person but I love this baby. She was either dumped or lost,I tried to find her owner. It took me a while to even get to feed her as she would growl and bark. When she did I would take the food back in. She is smart and figured out that if she didn't that she got kibble. Then it took me a month to get her to let me pet her. She was scared to death of people, but I would come talk to her several times a day. Finally we made friends! I tried to groom her as she would not get in the car and I can't find a groomer who would take her. We called a vet as the mats were so bad that they had made sores from her chewing them. They were unable to shave them but by sedation we had brought her to the vet and got her shots,wormed, and the mats removed. I brought her home and finished the job. 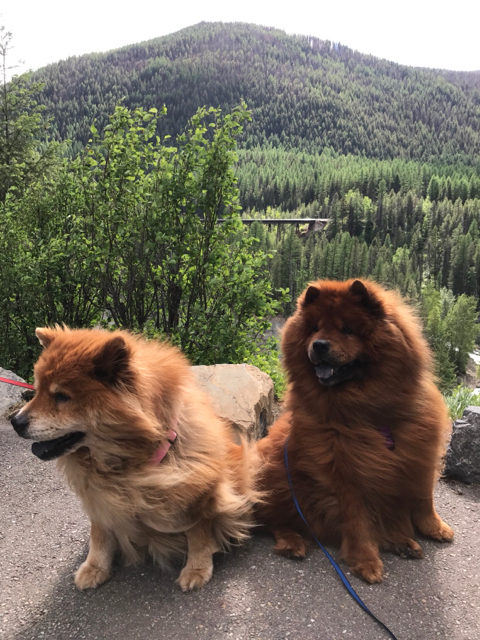 She's now our baby girl,a gorgeous red chow. The sores are healed and she's recovering from spay! She loves the grandkids and chasing the cats. She stays right in the yard, and sleeps on the porch,guarding her mom. My question is this, what kind of collar will not cause mats? I have tried one that said it didn't,it was a braided nylon. It did! I don't want any more mats I brush her daily. What kind do YOU use? Here we walk Molly with a pectoral, not a regular collar. It's much more comfortable for her. When she's home she wears no ID collar at all, but she doesn't go out by herself. If you want I can take some pictures and share them here. I use a harness for walks and a rolled leather collar for tags at other times. You can google the collar for pics. Bought both at Petsmart. Thank you for saving her. These two only wear harnesses. When at home they wear nothing. 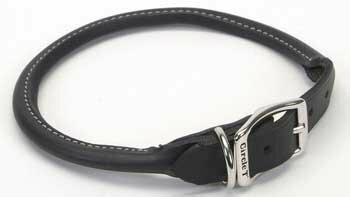 This is a rolled leather collar, I have a pair for my boys. I'm not sure any collar will be 100% mat-free, but if you take it off and brush under it daily youshould have minimal issue with these. My boys get mats in their arm pits, just friction will mat up the hair, and it happens fast with them after a bath. Good work winning this poor girlie over. I'm glad she found a good person.